Are Your Child’s Shoes Fit for Replacement? Pairing your child with the right shoes can be tricky—and even sometimes expensive! A large part of the reason is because kids’ feet grow so fast. When you’re an adult, of course, your feet don’t change much from year to year. A pair of shoes that is well made, properly cared for, and only used for certain occasions can last years and years (or even decades). Even an everyday walking shoe might last a year or two. Young kids, by contrast, may outgrow their shoes long before any signs of wear appear. The pace is pretty rapid, especially for kids under age 5. 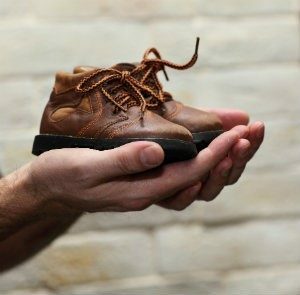 By the time kids are ready for their first pair of shoes, when they first start to walk, they may be gaining half a shoe size every two months. That will gradually start to slow, but even at age 4 or 5 your child may still need new, larger shoes 4 times per year. Not surprisingly, a pair of recent studies found that anywhere from half to three quarters of kids are wearing shoes that are too small. Of course, given how rambunctious kids and young teens can be, it’s very possible that a pair of everyday or athletic shoes could wear out before they get too small. If the treads are badly worn (especially if wear is uneven), insoles are wrinkly or weak, heels collapse under pressure, or uppers are scuffed and torn, it’s a sign your little one needs a shoe update. If your child is starting to complain that their feet hurt, of course, that’s another obvious sign. However, especially when it comes to younger kids, keep checking how the shoes fit every month or so. If the fit is tight—the shoe is hard to put on, or doesn’t provide enough clearance between the toes and the front of the shoe—it should be replaced, even if it still appears to be in good shape. You can’t always assume that your child will tell you when their feet hurt, so you may need to do your own detective work here. One additional word of caution for when you seek out those replacement pairs—for the most part, you should be getting your son or daughter new shoes, rather than buying used or supplying hand-me-downs from siblings and friends. We know you want to save money, and that buying new shoes three or four times a year is frustrating! However, shoes continue to break down with wear, and conform to the foot shape of the original owner. Even if the shoe looks good on the outside, it may not be appropriate. Exceptions to the “no hand me downs” rule may be made in the case of very young children (especially if they aren’t walking much yet) or for shoes that were only used very gently—for example, dress shoes that may have only been worn once or twice before being outgrown. If you’re not sure whether or not your child’s current shoes are right for them, bring them down to see the team at Dallas Podiatry Works. Our doctors specialize in providing appropriate foot care and footwear for patients of all ages and walks of life, including young children. To schedule an appointment, please call 972.566.7474 today.